It was billed as a potentially explosive affair given the bitter rivalry between Singapore and Selangor during the weeks leading up to The Sultan of Selangor’s Cup (TSSC) and both teams did not disappoint the partisan crowd of 25,619 with an exciting match which saw the Singapore Selection defend their home fortress with a 3-2 scoreline to retain the Cup. The Singapore side displayed unbelievable hunger in the opening stages of the match and it took them just 10 minutes to open the scoring when Yasir Hanapi provided a telling cross for Khairul Nizam to head home, much to the delight of the Singapore fans. Safee Sali then tried to launch a comeback for Selangor as he attempted an audacious bicycle kick moments later and the Malaysian international drew catcalls from the Selangor half of the stadium when he nutmegged Yasutaka Yanagi only to be thwarted by an alert Hassan Sunny. Safee would go on to face a barren first half when he found himself out-muscled off the ball by Irfan Fandi on several occasions and the PKNS striker often found himself stranded upfront without any service from his team-mates. The stands erupted in joy once again two minutes before half-time when Yasir played a superb through pass to play Shakir Hamzah onside and the Tampines winger placed the ball past Zamir with an accomplished outside-of-the-foot shot that left the Selangor custodian with no chance. Selangor earned a reprieve after the restart when they got a penalty through Safee, who was deemed to have been body-checked unfairly by Afiq Yunos, but to the dismay of the Malaysian bench, the 33 year old skied his spot kick uncharacteristically into the Kallang skyline. Khairul Nizam then earned a penalty for Singapore in the 58th minute when he was tripped while through on goal and Faris Ramli made no mistake from the spot, sending Zamir the wrong way with a coolly taken shot. The three goal cushion prompted a revival of the Kallang Wave but Safee had other ideas and pulled one back for Selangor five minutes later with a wicked shot that flew past Hassan into the right corner. 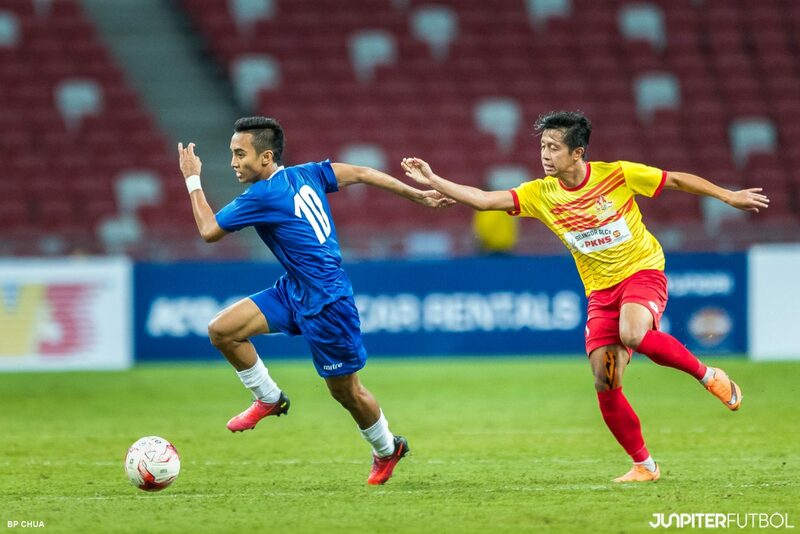 Gonzalo Soto then set up a tense finish to the match when he scrambled the ball in for Selangor following a goal-mouth melee but the Singapore Selection held on for dear life to ensure that they would finish as TSSC winners for the second year running. With the victory, the Singapore Selection has now matched Selangor as joint seven-time winners of the Cup. In the earlier matches played that evening, the Singapore and Selangor Veterans were declared as joint winners after a 0-0 stalemate while the Singapore Sports School defeated the Selangor Combined Schools in a penalty shootout after drawing 1-1 in regulation time.